Appearing on the back of this tee is a colorful rendition of Cliff Palace from artist Ruth Osa. 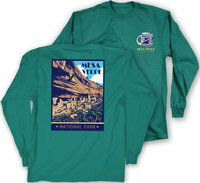 On the front left chest is the classic Mesa Verde park logo. Designed and printed in the USA. Crafted from a 50/50 ring spun combed cotton/poly for ultimate comfort. Featuring; a slightly slimmer body, shorter sleeves, 1x1 rib knit neck, tear-away label and shoulder to shoulder taping. Available in heather red or blue. Appearing on the back of this tee is a colorful rendition of Cliff Palace from artist Ruth Osa. On the front left chest is the class Mesa Verde park logo. Designed and printed in the USA. Features custom retro-style artwork of the iconic Cliff Palace. On the front left chest is a beautiful, artistic rendering of a Mesa Verde black-on-white mug inspired by an artifact recovered from Mug House. Designed and printed in the USA. 100% cotton, light-weight, long sleeve, crew tee. Available in a vibrant Jade. This tee features an artistic reproduction of a large Mesa Verde Black-on-White Olla, that can be seen in the Chapin Mesa Archeological Museum. Designed and printed in the USA. This short sleeve shirt wicks perspiration away from skin, transporting moisture to the outside of the fabric where it evaporates, keeping you dry and comfortable. Odor and stain resistant. Available in heather gray with red or black accent. Illustrated on this tee is artwork inspired by the legendary mugs on a string found at the aptly named Mug House cliff dwelling. Designed and printed in the USA. Crafted from a 50/50 ring spun combed cotton/poly for ultimate comfort. Featuring; a slightly slimmer body, shorter sleeves, 1x1 rib knit neck, tear-away label and, shoulder to shoulder taping. Available in heather turquoise and charcoal. This short sleeve shirt wicks perspiration away from skin, transporting moisture to the outside of the fabric where it evaporates, keeping you dry and comfortable. Odor and stain resistant. Available only in royal blue with white accents.